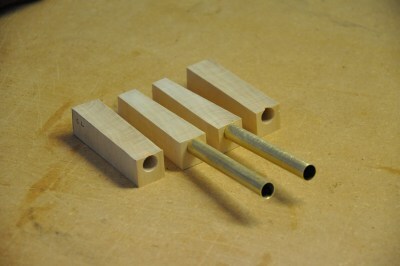 I made the joiners from solid basswood and inserted brass tubing, instead of making my own Kevlar tubes. 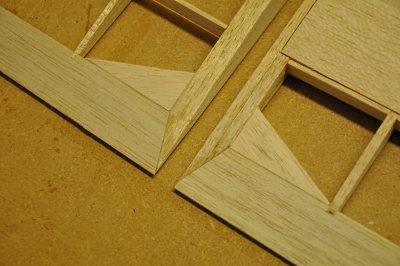 I drilled 4 holes in the basswood and the cut between the holes. I then used by belt and disk sander to bring the blocks to shape. 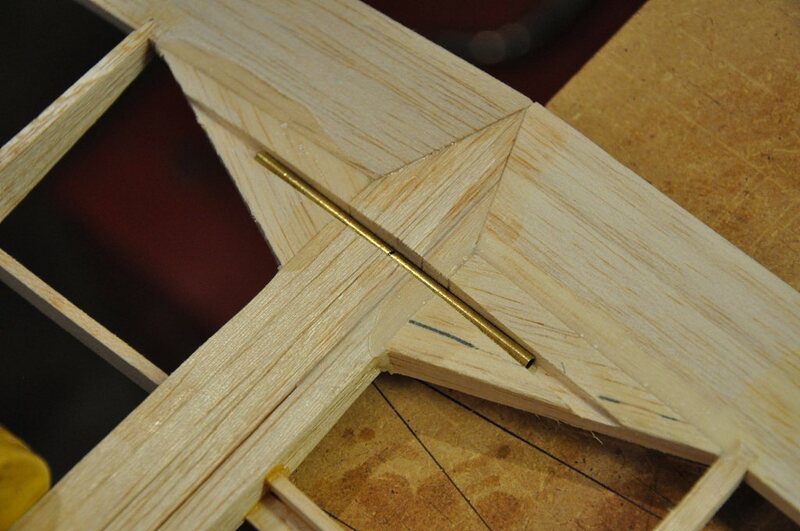 I left the brass tubes full-length so that I'd be able to use them to align the blocks when I glued up the mid and center panel spars. For good or ill, I left my blocks a little thicker than the spar webs... for some reason I felt that I just needed a little more basswood around the holes. 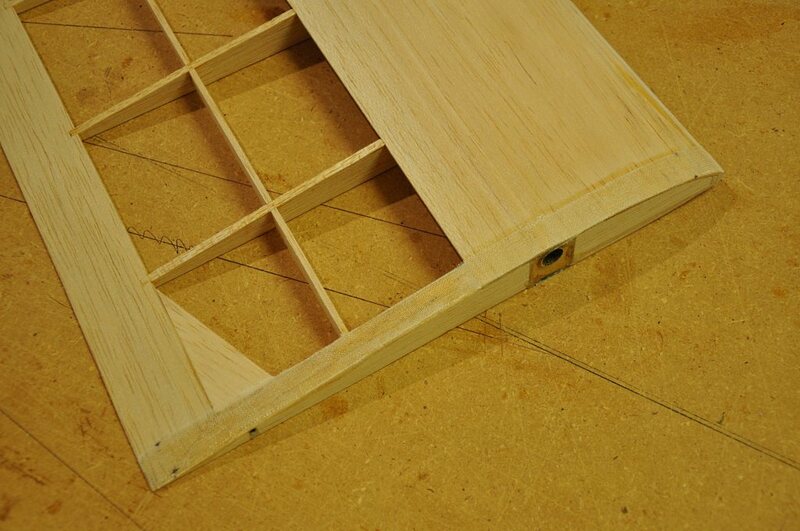 -- Probably a bad choice, but you'll notice the thicker spar at the joiner in all the wing panel pictures. Once in place in the spars, the joiners got a double wrap of glass over the normal Kevlar thread wrap. 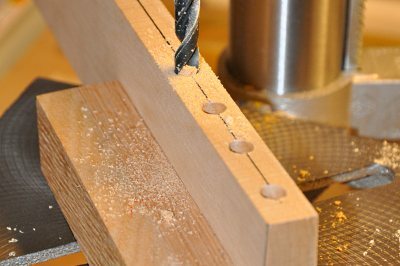 When it came to the trailing edge pin joiner, I felt that I didn't have as much material in the trailing edge as I needed to properly secure the pin. 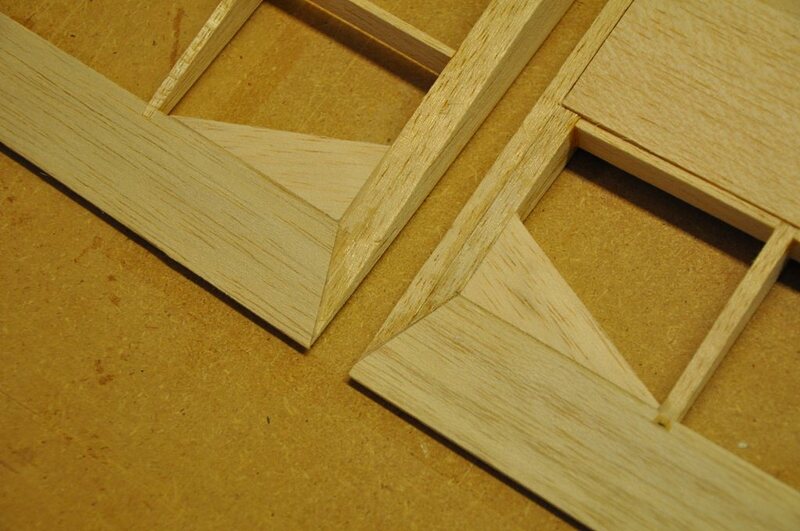 I added some solid balsa wedges on both center and mid panels. 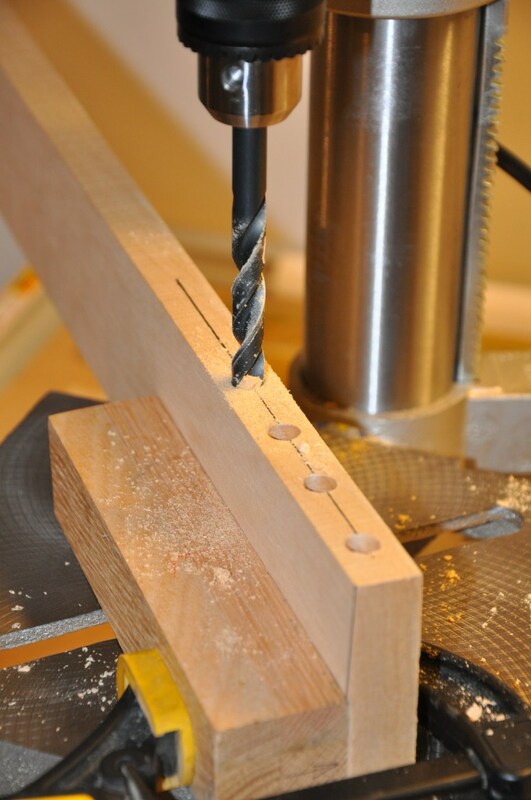 This gave me a thicker dimension vertically to make my pin groove cuts. 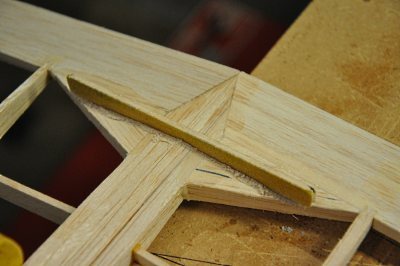 I joined the center and mid panels using the main joiner rod and a quick clamp. I then flipped the panels over. Using a flat stick wrapped in sandpaper, I notched a groove across the two panels at the appropriate location in the trailing edge. 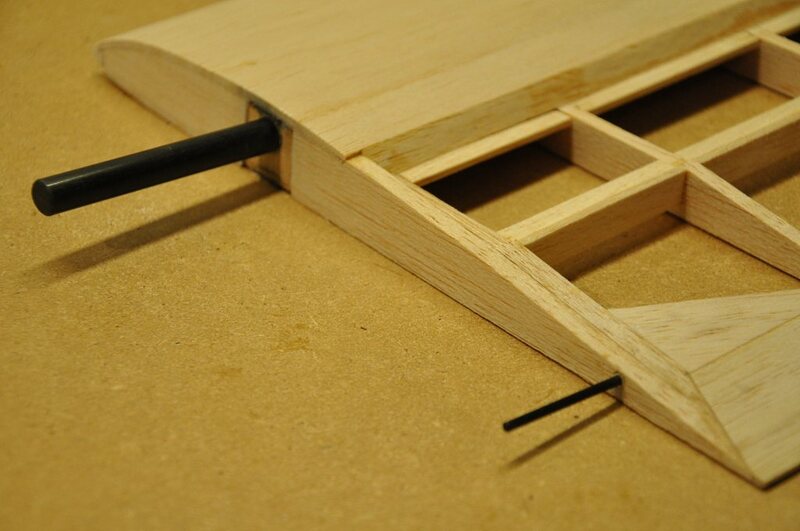 Care must be taken to ensure that the groove is in alignment with the main wing rod. I cut a brass tube and a carbon rod 2 3/4 inches in length. I cut the brass tube in half, inserted the carbon rod into the tubes, and sealed up the tube ends with wax. 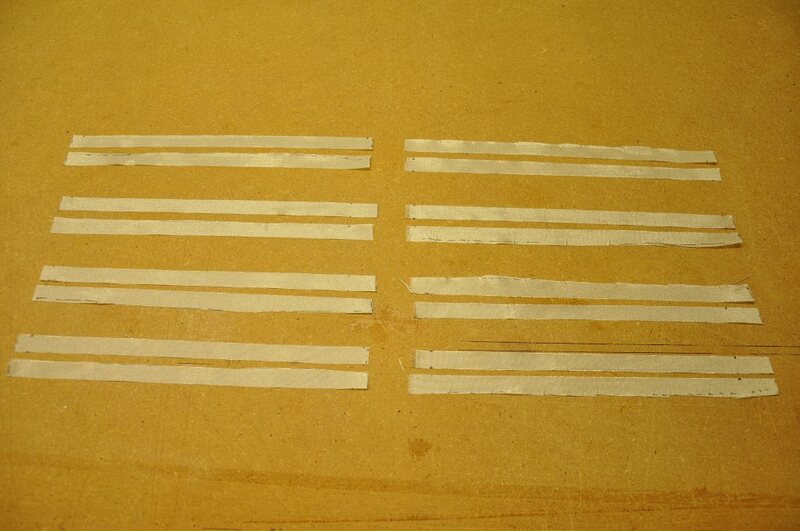 I placed the tubes into the groove, being careful to line up the break in the tubes with the edge of the panels. Finally, using thickened epoxy, I glued the tubes in place. Once the epoxy was set but not fully hardened, I carefully separated the two wing panels and removed the pin. I set the panels aside to allow them to finish curing. Now what remains is to glass in the end ribs on each of the panels. I looked at the plans quite awhile before proceeding with glassing the end ribs on the mid and center panels. What I came up with was that the fiberglass reinforcement acts as a cap on the end rib pairs to help transfer torsional loads and keep the ribs from splitting or peeling from the spar. So I cut 16 1/2 inch strips - two for the top and bottom of each set of ribs. 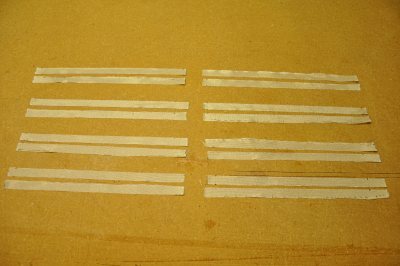 I brushed slow epoxy on the 1/2 inch strip of the end ribs - from trailing edge to leading edge, and then laid down 2 strips at each location. Once the tops were cured, I flipped the panels over and repeated the process fro the bottom of the ribs.